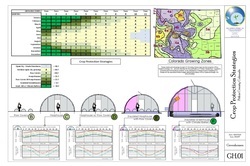 Greenhouse Design - eco systems design, inc. Using crop protection strategies from simple row covers to four season solar heated and cooled greenhouses, you can create extended growing seasons for warmer zone plants, or an indoor climate capable of supporting Mediterranean and even Tropical perennials like figs, citrus, bananas, papayas and passion fruit. Using simple passive solar heat storage technology, such as "climate batteries" under greenhouses, you can support a wide variety of annual and perennial food plants, almost anywhere! Climate Analysis is the process of balancing your desired indoor growing climate within your outdoor climate extremes, using solar heat storage, energy efficient enclosure, and climate controls. High Tunnel and Hoop House designs can be lightweight and inexpensive greenhouse solutions, and can be used with climate batteries and energy efficient skins. Growing Domes are excellent greenhouse solutions for backyards, community groups and Edible Schoolyards, which we promote and use to inspire young gardeners. Climate Battery Technology uses the soil to help moderate high and low temperatures with limited energy usage. Four Season Greenhouses can range from small home scale buildings to large commercial scale models with a variety of growing options available. 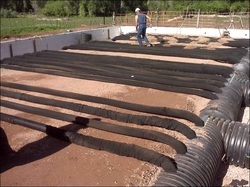 Season extension is a valuable and economical tool for the sustainable food grower.